Being according to the trend have you purchased new computer? Struggling to transfer your data from your old computer to Windows 8? How about the external hard drive? Oh you don't want spend that much amount for it? Then how would it be if you go for a Windows Easy Transfer feature? Perfect! This would really be a helpful for one for you. But the thing is Windows Easy Transfer feature, transfers only some documents such as Pictures, Desktop contents, Videos, etc. It cannot transfer programs that are currently running on your new computer. Whatever programs that are willing to use on your new Windows 8 computer have to be reinstalled. 1. Initially connect an external drive to the old computer. If you use Windows Vista or Windows XP you should download and install 'Windows Easy Transfer' feature first on your computer. As soon as the program is installed, it gets started automatically. In case you are use Windows 7, click "Start" button and type 'Windows Easy Transfer' and after that click on its search result as soon as it appears. 2. Now Click on """Next""" button and you will be driven to a screen where you must select how you want to transfer your data. 3. Click on USB flash drive or external hard disk and you will be moved to a screen where Windows asks you whether this is your old or new computer. Kindly click on "This is my old computer" button. 4. Now you will be at a screen where Windows Easy Transfer is scans your computer for information. Once the process is done it displays a list of all the users on your computer and how much data is probable to be transferred. 5. Since we are upgrading to Windows 8, you must not transfer Windows setting. To remove Windows settings option, click on Customize link which is under every user and under the Shared Items. This displays a small screen. 6. Now remove check mark ""Next"" to the Windows Settings. If you want to view what folders are going to be copied over, you should click on the Advanced button, that lets you to browse from end to end the data that is going to be transferred. If you do not wish to transfer particular data, just clear the boxes present ""Next"" to that data by simply clicking on them. If box is white, then data is not going be transferred. When you are happy with your selections, ""Next"" click on little red X button present in the upper right hand corner of the on top of screen. After that click on the ""Next"" button. 7. A screen will be displayed where you should enter password to access the data file. If you would like to set a password to guard your file, you should enter your password and after that click on ""Next"" button. 8. Now you will be prompted to a location where you hope to save the file. You must double-click on drive letter linked with the external drive which is plugged into your computer. After you double-click on drive, click on "Save" button. 9. Windows now saves your selected data to external drive. It might take some time to complete the process, do kindly be patient. 10. After saving of data is finished completely, Windows Easy Transfer informs you regarding the same. Now click on the ""Next"" and you will be at the final instruction screen. 1. Type Windows Easy Transfer on the Windows start screen and then start "Windows Easy Transfer. Click on it when you see it in the search results. Windows Easy Transfer opens now and you must click on "Next" button. Now a screen will be displayed before you asking the way how do you like to transfer your data. 2. Click on "USB flash drive" or "An external hard disk" option. On "Next" screen while it inquires if this is old or new computer, click on "This is my new PC button". 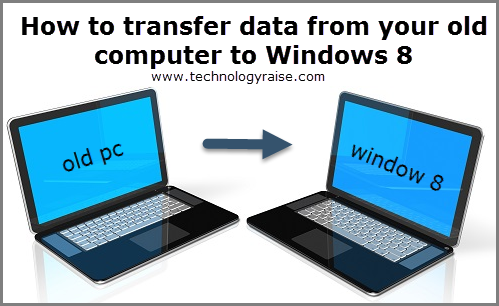 Windows Easy Transfer feature displays a screen inquiring whether your data is previously saved on the external drive. 3. Ensure that your external drive is plugged into Windows 8 computer and after that click on the "Yes" button. Windows opens a browse screen and display all the drives available on your computer. Double-click on drive where you have saved your older data. 4. A file by name Windows Easy Transfer - Items from old computer will be displayed now. Left click on the file to select it and after that click on Open button. A new screen opens displaying the users data that is going to be copied to new Windows 8 computer. 5. Initially you must click on the "Advanced Options" button. A screen will now display the mapping between the new and old users. 6. On the screen you can indicate which account on new machine the user's data from the old machine must go. In case both the account names are same, you need not change anything here. Click on the Map Drive tab and also indicate which drive on new machine the data from the drives on machine must go. Once you got the necessary settings, click on "Save" button. 7. Choose the things that you want to transfer to your new PC. Click on "Customize" option for every user or Shared Items. Click on "Transfer" button, once the process is done. * "See what was transferred"
computer by Windows Easy Transfer. As soon as you click on this option, Windows Easy Transfer displays a report of applications that are installed on the old computer. This list can be further used to verify if you want to install any of these yet again on the new computer. 9. Once you are ready, click on Close button to close the Windows Easy Transfer. Your data is now been transferred successfully to the new Windows 8 computer.